George Nelson’s classic 1958 design. 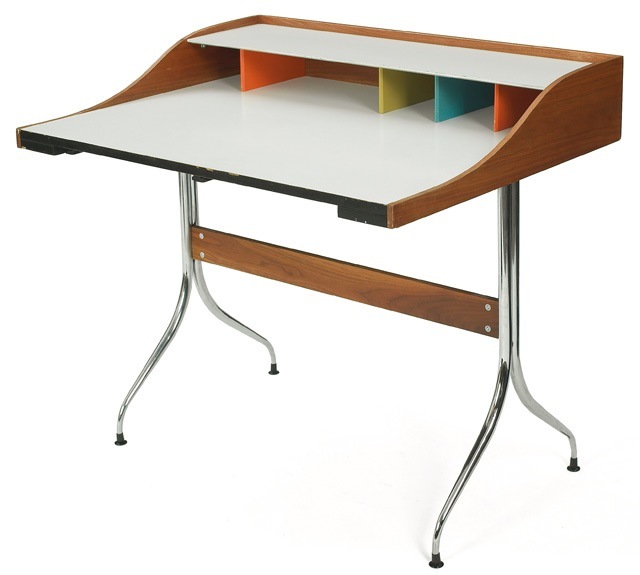 Always loved this desk (walnut and white laminate gets me every time), so pricey though ($1745!). As a designer it’s a tough decision when it comes to furniture. Do you spend your money surrounding yourself with inspirational pieces of design like this, or do you spend it on equipment to make better design yourself? I always lean heavily towards the latter, as evidenced by the glut of Ikea products that fill my house. I bought a design piece once and it didn’t do anything for me .. a total waste of money. It’s just standing there, being orange and smuck. I think an Apple machine might be the in between here, Scott. Great blog and work, Scott. When I ask myself about a massive investment in original design, I usually start with: “How long will this last me?” A desk like this will be with you for the rest of your life. Far better than a car at the same price. If you use it, it’s worth it. Then there’s this advice from Katherine Hepburn. I love the desk, but Hepburn is rich and I’m not. I don’t think I’d ever be able to forget paying 2k for a desk.